Carl Anderson, Ph.D. has been the creator and performer of quality, thought provoking entertainment for families and children for over 20 years. He is the founder of Thistle Mouse Productions and maintains an active schedule as a speaker, storyteller, and monologist to schools, festivals, and churches. He has been called Central Texas Best Storyteller. He is also a licensed psychologist. Carl has worn the familiar red suit for over 20 years. He has been featured on CNN, NPR, and CBS, and has also appeared in countless articles in both print and e-news. He has been heralded by Los Angeles Magazine as the closest thing to Santa since Edmund Gwenn held Natalie Wood on his lap in Miracle on 34th Street. 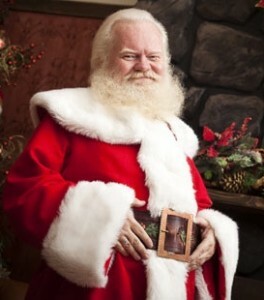 CBS Evening News named him one of the country’s premier Santas. His vast knowledge and dedication to the children and families that he serves, as well as the role of Santa Claus, truly make him one of the foremost Santa Claus experts of all time.